An American held in Qatar in the death of his adopted daughter stood up and yelled, “You lie! 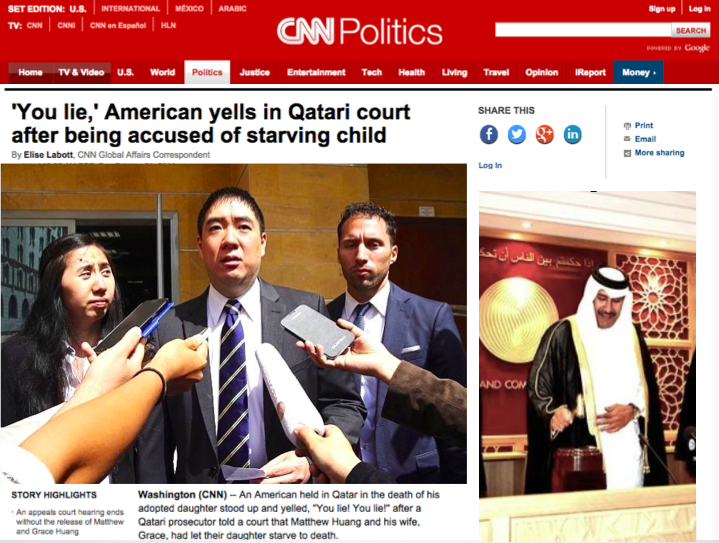 You lie!” after a Qatari prosecutor told a court that Matthew Huang and his wife, Grace, had let their daughter starve to death. “This court is a sham,” Matthew Huang said after the rare dramatic outburst, evidence of his frustration at being convicted of killing his own daughter on what he and his wife say are trumped-up charges. Their best hope now may be that the U.S. government applies diplomatic pressure to free them. The couple pleaded with the U.S. government to end their two-year legal nightmare, warning that without direct American intervention, they will be falsely imprisoned once again. The court set November 30 to decide whether to grant the defense request to overturn the conviction, or to grant the prosecution’s request that the full sentence of up to 3 years in prison be upheld. “One thing today did is help confirm that this is not about a legal court process and the solution is not going to come from the court. It has to come from U.S. intervention.” said Eric Volz, who heads the firm David House Agency that is assisting with the Huangs’ case.